A targeting vector for the Rosa26 gene was constructed using the recombineering approach and utilizing the Cre-lox system for future RMCE manipulations. The long and short arm Rosa26 fragments (LA & SA) are 8.232 kb and 3.770 kb respectively and were derived from a RP22 BAC clone (#58-D17). A 5.165 kb region between these arms has been replaced by the floxed tk-neo cassette, a puromycin-Δ-thymidine kinase fusion gene driven by the mouse phosphoglycerol kinase promoter (pUDTK) and a kanomycin resistant gene driven by the bacterial EM7 promoter (EM7-kan) flanked by minimal (34 bp) tandemly oriented lox71 and lox2272 sites (Cre-recombinase recognition sequences). The construct also contains a diphtheria toxin negative selection cassette (pgk-DT-A). 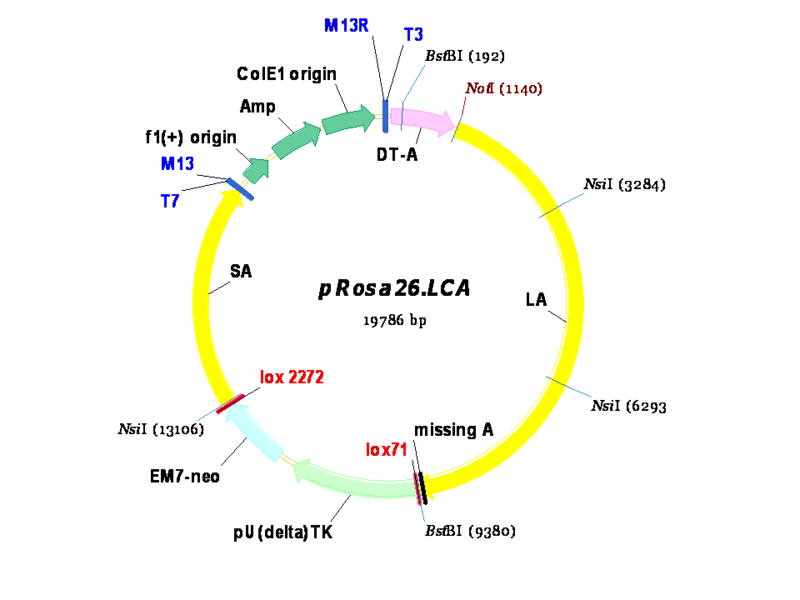 It should be noted that the LA contains a single base difference in what is contained in this targeting vector plasmid and the predicted sequence derived from MGI database: database predicts a 17 bp run of “A’s” at position 9274 of the targeting vector plasmid; the sequence data confirms only 16-A’s here in the plasmid.